The Encinitas Temple is a branch of Self-Realization Fellowship (SRF), an international religious organization founded in 1920 by Paramahansa Yogananda to disseminate the universal teachings of Kriya Yoga, a sacred spiritual science originating millenniums ago in India. The Temple offers a full program of inspirational lecture services, meditations, scriptural reading and meditation services, kirtans (devotional chanting), Sunday School and Teen classes, and other activities to introduce truth seekers to the timeless teachings of Paramahansa Yogananda and help them deepen their spiritual practices. 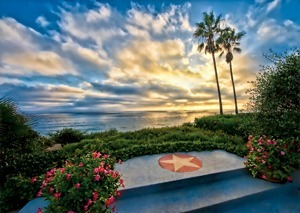 The nearby Encinitas Ashram Center and Meditation Gardens were established by Paramahansa Yogananda during his lifetime, and have become a center of pilgrimage for thousands of people each year, who come from all parts of the globe to visit the site where this great world teacher lived, worked, and communed with God.